WordPress is by far the simplest content management systems to use, and thanks to plenty of theme builders it can be customized in different ways for everything from blogs, personal sites, company sites, portfolio sites, to e-commerce websites. Themes are the elements that take WordPress to the next level, giving almost anyone with any skill level the ability to create a beautiful fully functional website. There are millions of WordPress themes out there and finding the most suitable theme for your project can be a daunting task. A WordPress theme must meet the following criteria to be considered good. Functionality: The best themes are those that include the most user-friendly and technologically relevant features. Standards Compliant Coding: A good theme takes into consideration proper PHP, HTML, CSS, privacy and security protocols. Quality code is the skeleton for a quality website. Responsiveness: Responsive design is the top must-have feature of all websites for 2017 and is a must when it comes to WordPress themes as well. With the number of people viewing information on tablets and mobile phones, it is vital to use a theme that allows users to view content clearly regardless of device. Social Sharing: In today’s web environment, social sharing is a must and themes have to be expandable their flexibility with the number of social networks supported. At a minimum, designers should look at themes which allow sharing across Facebook, Twitter, Instagram and Pinterest (four popular social sites that emphasize visuals). Retina-ready: This might not seem as relevant as the top 5 above, but with more users buying HD devices with retina displays, the quality of images and visuals matters more than ever. This is true for WordPress themes as well. The number of retina-ready options available is growing daily and becoming an in-demand feature. SEO: When it comes to SEO for your websites, the theme you choose can have a huge impact. So, rather than spend hours searching the web for the best WordPress themes, using insights from our in-house content specialist, technical SEO specialist, WordPress theme shops and web developers around the world, here are the best WordPress themes to suite your needs. In ascending order with 40 being the least, here are the 40 best themes available across board. Note: Selection was determined based on the 7 very important features listed above. Although a theme must cross all checklist and include additional functionalities that differentiates it from others. Excite – Clean Responsive Multi-Purpose WordPress Theme is one of the Best WordPress Theme you can get. Excite is an all-in-one High Definition Clean Responsive Mobile Friendly made with Bootstrap, with over 50+ and complete bundled website with 12 elements/shortcodes included; ready to use website bundle covering different aspects of business. SimplUI is designed keeping the mass users in mind which is white clean and responsive good for business, corporate, parallax, responsive, multipurpose, portfolio, agency, blog, creative, design, landing, minimalistic one page, modern, onepage, personal, simple, stylish, vintage, white, from interacting with the website to designing UI/UX everything is simple and explicit. It is tested with non-tech users and the results are positive. Codes are optimized and extra care is taken to increase performance and reduce load time, documentation include tricks to maximize performance and total theme installation. Juno is a professional, multi-purpose theme with tons of customizable features, widgets and a crisp, clean, and modern design. This theme is great for use as a blog, business site, marketing agency, photography and more. With the emphasis placed on simplicity and elegant design, Juno ensures your site looks great with minimal customization work. Juno allows you to easily customize colors, fonts, sizes, as well as feature Woocommerce products, posts or pages. Juno includes features such as a slider jumbotron area, masonry style blog, fully responsive design, customizable colors and widget areas, left and right sidebars, customizable fonts and a lot more features that are not usually found in a free theme. Revive is more than a basic theme and offers enough functionality for a small website. Revive is just the thing your site needs. It is at par with most of the themes in this last group of 10. It has all the features you need to create simple and wonderful site. Some of the main highlights of the theme are Retina Ready, Fully Responsive, Multiple Layouts, Translation Ready and also, revive is highly customizable and versatile. It also offers all the features that meet our criteria. Although it loses point on offering minimal functionality in it free version. Bento is a powerful yet user-friendly free WordPress theme intended for use in the broadest range of web projects. It boasts premium-grade design and is packed with awesome features, some of which are unique for free themes. Bento is mobile-friendly (responsive), retina-ready, optimized for speed, and implements SEO (search engine optimization) best practices. The theme offers unprecedented customization flexibility through the native WP Customizer interface as well as built-in layouts, including one-page template. Unlimited color combinations for every element of the website, 500+ high-quality vector icons, advanced typography based on Google Fonts, and tons of other cool options and settings make it an ultimate tool for creating websites that are eye-pleasing, unique, and tailored to your needs. Bento theme implements clean, well-commented, developer-friendly code, and includes detailed documentation and a child theme template. The Hueman theme has a versatile design. That’s why it is used on different types of websites such as blogs, magazines, small businesses, schools, church or personal websites. Features includes Extensive styling options, ultra responsive, Integrated social sharing and share count, easy customization using themes option, custom built widget, custom page template, coding is neat and adheres to the WordPress coding guidelines. The theme has built in child themes with pluggable functions and files. Above all, the mark-up is search engine optimized to allow the best possible ranking on search engines. Poseidon is a free WordPress theme with a spacious white layout. Designed for content rich blogs, magazines, news, and gaming websites. Poseidon comes with a full-width slider, homepage layout, and multiple page templates. The homepage layout can be easily setup using widgets. Blog way is minimal blog theme. This responsive theme is best to use for blog, travel, informative and life style coaches. It comes with option to change color of entire site, author profile widget, social links to connect with social networking sites and more. It supports Woo-commerce and can be used for perfect e-Commerce sites too. Illdy is one of the best Free One Page WordPress Business Theme out there. It is a stunning multipurpose WordPress theme built based on Bootstrap frontend framework making it fully responsive and mobile friendly. This theme is well suited for business, landing page, portfolio or any other creative websites. This leaves heavy lifting to WordPress Customizer therefore you can create your website on live preview mode. Which means that you can see changes happen on your website in real time as you make them. It is retina ready, therefore it ensures razor sharp text, vibrant colors, stunning graphics, sharp images, premium feel and beautiful vectorized icons on HiDPI (Retina) displays. News Portal is ultimate magazine theme with creative design and powerful features that allow you to quickly and easily create a style to suit your needs. It is completely built on WordPress Customizer which allows you to customize most of the theme settings easily with live previews. It is a fully widgetized theme so as to let users manage the website using easy to use widgets. News Portal Theme is ok to create a News/magazine/blog websites with ease. The free version, although checks some of our criteria, does not have the addon features to make it stand amongst the premium themes. One Page Express is a beautiful WordPress Theme that can be used to create a one page website in minutes by drag and drop. In comes with a predesigned home page and over 30 ready to use content sections that you can easily customize. It also has lots of customization options (video background, slideshow background, header content types, etc) that will help you create a beautiful, unique one page website in no time. One Page Express is responsive so it works on mobile devices out of the box. 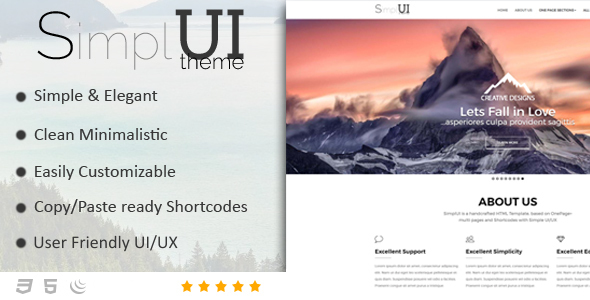 A stunning and flexible multi-purpose theme from ThemeShift. Perfect for businesses of all sizes, you’ll find that SimpleShift works well for small retail shops and large creative agencies. Fully responsive design that looks beautiful on viewports and screens of all sizes and resolutions. SimpleShift is fully compatible with WooCommerce the most popular e-commerce plugin for WordPress. Create your store in minutes and begin selling your products immediately. Our themes are cleanly coded and SEO optimized so Google will favour your website over many others. News Portal Pro is modern ultimate magazine theme with creative design and powerful features that allow you to quickly and easily create a style to suit your needs. It is completely built on Customizer which allows you to customize most of the theme settings easily with live previews. It is the fully widgetized theme so as to let users manage the website using the easy to use widgets. News Portal Pro Theme is best choice to create a Beautiful & Powerful News/magazine/blog websites with ease. Unlike it free version, the pro theme contains Pre-loader features which can be used to show the loader at the time of loading process of your site. The pro theme is compatible with WooCommerce. You can install WooCommerce plugin and setup your online store using this theme. The theme also provides a website review system for each post which helps to create or build powerful magazine site. But a lack of robust social sharing features limits it usage. The price is also too steep given that there are more robust themes out there with lesser prices. OceanWP is one of the best free themes out there today. If you are trying to design a website with zero budgets, it is the perfect theme for your project. Lightweight and highly extendable, it will enable you to create almost any type of site with a beautiful & professional design. There are several options to personalize your website, multiple widget regions, a responsive design and much more. Developers will love it’s extensible codebase making it a joy to customize and extend. It easily integrates with Elementor page builder and WooCommerce. You can also build websites with ease using the creative imported demos. Mesmerize is an incredibly flexible, multipurpose WordPress theme that can help you create an amazing website. It comes with a predesigned home page, 5 header designs and over 30 ready to use content sections that you can easily customize. It also has lots of customization options (video background, slideshow background, header content types, gradient overlays, etc) that will help you create a beautiful, unique website in no time. Mesmerize is responsive so it works on mobile devices out of the box and it is also WooCommerce ready. Mesmerize also includes a variety of hero layouts and media types (image, video, multiple images, lightbox button, etc). To add a finishing touch you can use color, gradient and shape overlays. You can also integrate Google maps to your website – with the Google maps sections they’ll know exactly where to come. Selling products or services? With the pricing table sections you’ll be able to easily include product description. This is the first of our education themes on this list. Scholarship is the best free WordPress education theme designed for university, college, school, online courses and other education-related websites. The theme displays your site in the best possible way on smartphones, tablets, and laptops, as well as large desktop screens. The theme has a clean design with powerful features. Scholarship would be the best choice for anyone with intent to promote education online. It does score more point with its built-in Customizer tool which allows you to customize the theme complete with a live preview and build an awesome website quickly. One of the cons of this theme is there haven’t been any update since it was created which is not that quite long. Also, like it sibling, the news portal theme, it lacks a robust social sharing feature. Education Hub is a clean and elegant WordPress education theme with simplistic but unique look and feel. This theme is best suited for college, school, university and other educational websites. But this theme is not developed to be fit for educational websites only. It is flexible enough to be used for business and corporate websites. This theme is highly customizable with layout settings and several other theme options which can be customized by using Theme Options panel based on powerful Customizer API. Education Hub helps you to easily and intuitively create professional and appealing educational websites. Seniman is Modern Portfolio WordPress Theme that is suitable for Designers, Freelancers or Artist. Seniman uses drag and drop page builder for built the page elements, makes it easier to arrange your layout. This theme also served with extensive theme options. With header builder and footer options, every theme was created to have their controls. Seniman will show off your work with this easy-to-customize and fully featured WordPress theme. Customizing is easy even for beginners. It also ticks all the necessary requirement to be on this list. Paragon is a clean, multifunctional, highly customizable WordPress theme. It is suitable for creative professionals, agencies, freelancers, illustrators, photographers, and others. A large number of options and add-ins will allow you to understand what a real premium template is like. Paragon is very easy for newbies and professionals to work around. The typography fundamentally was built in support for adobe typekit in order that your favourite fonts were with you. Size, color, font – all this can be changed in our theme. Paragon includes several types of display blog, 4 types of posts, 2 kinds of pages and an unlimited number of portfolios, which can be suitable for any purposes. DJ Rainflow is a new WordPress theme with functional modern design best suitable for music bands, DJ’s, singers, artists, radio, events and entertainment websites. The theme includes 3 homepage layouts allowing you to give all the necessary information about the dj’s compilations, discography or any upcoming music event. With DJ Rainflow you can showcase your photo and video galleries of the held or planning events. The theme can also be interesting for music producers, musicians or anyone in the music industry. The theme supports Events Calendar, which is a big plus if you seek to build such kind of a website, because with this plugin, you are able to inform your users about what your’re up to. This theme is obviously all about music and perfect if you’re looking to really stand out and build your brand. It comes with one-click demo so you can get started with the existing design, but is packaged with Visual Composer so you can use drag and drop to change up how it looks. HR Human Consult is a light and airy WordPress theme created specifically for HR consulting services including HR recruiting firms and HR solutions companies. It will also make a good website for human resources outsourcing companies looking for a high-quality website. The theme is not overfilled with unnecessary elements and has all the sections needed for a professionally looking corporate website. The homepage with a full-width slider will be a perfect place to put your motto and let your clients know what your company stands for. The theme is powered by Twitter Bootstrap v3 and Unyson Page Builder. This human resources-focused theme is powered by Bootstrap v3 and Unyson Page Builder hence it’s very easy to customize; ensuring site visitors will have a pleasurable user experience. Plus, if you want to change up the design, all the PSD files are included. Magazine is created by themify. It is a 3-column theme designed to be used with the Themify Builder. Using the intuitive drag and drop capability of the Builder, the Magazine theme allows you to build any kind of layouts at ease. You can build complex grid layouts like Guardian, CNN, MSN, and BBC in minutes. It is a responsive & retina ready theme packed with many features: 42 pre-built layout options, mobile slide navigation, mega menus, widgetized areas for banner ads, awesome icon font, breaking news ticker, social share buttons, related posts, footer menu, social links, and more. If you are looking for a flexible & powerful theme for editorial/news sites with mobile & retina support, Magazine is a great choice. Magazine offers a breaking news ticker in the header area as seen on many editorial sites like the Guardian site. The breaking news can be customized via the theme option panel. For a fairly new wordpress theme, trendion makes our top 20. Tredion takes the word premium to another level with a sleek and modern design for a personal fashion or lifestyle blog, an online journal or a magazine. The theme features handy side menu, Instagram feed support and full responsiveness. Trendion comes with built-in Visual Composer plugin that allows you customizing all theme’s elements and creating new pages. Coastline is a portfolio theme. It uses a sidebar navigation menu and displays images of your latest work in a grid layout. It also comes with flexible layout options, including a slideshow, an image array, column listing and infinite scroll. Coastline comes with multiple options to configure its layout: portfolio display (slideshow, image array), column listing, and infinite scroll homepage. It is also optimized to use your favourite page builder (Elementor, visual composer, div builder or siteOrigin). The Voux is a comprehensive magazine theme designed with absolute attention to detail. Within you will find five beautifully crafted homepage styles to get you up and running quickly, with no coding to do. Of course you can simply create your own with the industry standard best Page Builder, Visual Composer included in your purchase. Coded to the highest quality standards The Voux, naturally, is fully Responsive for today’s devices and will scale with pixel perfection even on Retina Ready Screens. Build anything using Drag & Drop Interface of Visual Composer Built from the ground up using Visual Composer at the core means you can be confident you will get up and running with a few clicks. You can also import some demo data and have a visually stunning website ready within minutes. The Voux has great premade demo content library that you can chose from. If you are looking for a WordPress blogging theme that is well structured, versatile, and full of bold elements, then ThemeShift’s newest theme, Underwood is your answer. Setting the stage for your content to be front and center, Underwood has no use for excessive flashy design. Instead, this full-featured theme offers impressive features for making a statement to anyone that visits your website. Underwood is built on the powerful Bootstrap Framework, making it mobile-friendly and fully responsive so every site visitor can share the same experience despite their device type. This includes those on the go viewing your site from laptops, tablets, and even mobile phones. Additionally, Underwood makes use of the built-in WordPress Live Theme Customizer. With it, customize colors, fonts, layouts, and much more with ease. With a modern design and minimal feel, your site’s content will be the focus and your images will shine. Moreover, with 3 flexible front page options available, you can personalize your website to stand out amongst all other blogging sites on the web today. For example, add a full-width post banner, choose from hundreds of Google fonts, and brand your site using unlimited color options. In addition, implement custom widgets throughout your site to garner more site engagement, share more information, and provide a better user experience for those viewing your content. Lastly, take advantage of nine beautiful post-formats that wrap effortlessly around your photographic, video, audio, and written content. Underwood comes complete with a Featured Content Slideshow option for adding high-impact visuals to your readers upon first clicking on your website. More so, you can choose from 9 custom post formats utilizing multiple media types, and even utilize the cascading grid-style front page layout with or without a sidebar depending on your individual site needs. Finally, Underwood integrates social media directly into its theme so you can boost social shares, gather more followers, and even share stunning images via the tiled Instagram feed that fits seamlessly into your footer or sidebar. The Moody flexible multipurpose WordPress Theme is a new generation of multipurpose WordPress Theme. Offering a huge package of 24 homepages, Moody combines minimal and perfect grid design with function ability and usability. It has a fresh Squarespace-esque design, with beautiful smooth scrolling and responsive. Lots of options for customization. It integrates seamlessly with WooCommerce. Most important, it ticks all the criteria in our checklist and provides great customization. BRIDGE is a retina multi-purpose WordPress theme built on the QODE framework. You can easily import any of the example demo sites. Choose your favourite design or style, and import pages and settings with the easy-to-use one click import feature. You can have a fully equipped website up and running within just a few minutes. Bridge is not just made an ordinary theme; it’s a collection of amazing examples with tons of features. It contains 247+ Unique Demos websites you can import and use as a template for your choice of website – whether you’re in search of a blog, a business website, or even something as specific as an online store for your pet shop. Easy to import and highly customizable, Bridge was created to make your life easier. 24 Layout Concepts – Explore all Bridge possibilities with 24 new layout concepts – ranging from standard site layouts to authentic and innovative designs. You’re certain to find the perfect solution for your perfect website within the collection of creative concepts. In addition, BRIDGE comes with an extremely intuitive, easy-to-use admin interface. Add unlimited sliders and slides while you are editing pages/posts/portfolios, add unlimited portfolio images or videos while editing your portfolio items, add unlimited parallax sections to any page, customize typography styles, upload multiple logo versions, and much more. Take complete control over your website. Like other premium WordPress themes, Bridge comes packed with plenty of features and meets all our criteria. Book Your Travel is online booking theme with a clean, modern, and responsive web design. The theme is best suited for booking portals, travel agencies, guest houses, hotels, hostels, bed and breakfasts, villas, Airbnb style bookings for your condo, travel blogs, or anything that requires the use of a booking portal. The Book Your Travel WordPress theme has kick-started a revolution in WordPress travel themes and is directly responsible for drastic improvement of the tourism niche. Book your Travel theme has an advanced web interface which will allow you to modify the theme for slight customizations. The theme is optimized for search engines, and comes with 9 beautiful colour schemes included which again can be changed via options panel. This fully responsive WordPress theme was designed and developed specifically for travel agencies, tour operators, cruise operators, car hire companies and others in the tourism niche. A fully translatable theme, Book Your Travel boasts features such as a powerful and completely integrated booking system, an availability checker, advanced search filtering, front-end management for partners, review system and much more. Book Your Travel theme is easy to set up and comes with predefined demo content. This allows you to quickly set your website up. Book Your Travel was built from scratch on W3C valid and semantic HTML5 code with best SEO practices in mind, which allows search engines to easily index the content of your website. The code is clean and strictly adheres to WordPress standards. 9 beautiful color schemes are included and are ready to be used. You can switch between them from Theme Options in the admin panel. Book Your Travel supports RTL (Right-to-Left) languages with no extra coding required. A RTL stylesheet is built directly into the theme and you can enable it with one click in Theme Options. Book Your Travel theme includes all necessary files in order to be translated in the language of your choice. It is also compatible with the WPML plugin. A powerful booking system has been developed especially for this theme. It includes an advanced search, availability checker, special search results with advanced filtering and more. Bookings can be created by users on the website or by admin in the dashboard. The system will always deduct items correctly. You have the option to choose, whether you want to use the full booking system with payments or use only the reservation system with no payments and manual booking confirmation. There is also an inquiry form provided for each accommodation/car rental/cruise/tour, for users to contact the respective managers directly. It can be hidden as-well. Pricing per person, child, room, cabin or group. Daily, weekend, weekly and monthly pricing. Minimum and Maximum day stays, specific allowed check-in and check-out days of the week for stay… Book Your Travel has it all. You can also create unlimited extra items that act as surcharges such as all-inclusive, Wi-Fi, insurance, cribs, baby seats and assign them to accommodation type(s), tour type(s), cruise types(s) and/or car type(s). These are not pre-defined which means that you can create everything you need. Per each item, you can define whether it is priced per person or unit and per day or per stay. These items are then added to the bill at the booking process. Users can leave reviews after they complete a reservation. Admin can also insert them from the dashboard. The system calculates the score and displays it as user rating. Reviews can also be disabled from the Theme Options. You can create as many parameters to be reviewed as you want with our dynamic fields’ builder. Book Your Travel theme includes custom register, login, forgotten password pages and a front-end platform for users to easily change their user data and see their past bookings and reviews. A designated area for your partners is also provided. It consists of a custom registration page and a front-end platform for partners to easily create and manage accommodations, cruises, tours and car rentals. They can also manage availability, schedules and pricing. As admin you have the option to restrict immediate publishing and hold partner generated content for review. Each accommodation / car rental / cruise / tour / location data type has its own tabs and fields builder in Theme Options. Here you can build your own tabs that are displayed on single accommodation, car rental, cruise, location or tour page. You can also create your own review parameters. Use simple drag and drop for ordering and positioning. Now you can also easily create your own fields from the admin panel. You can also hide specific inquiry forms when needed. Countless logically organized and structured Theme Options offer you convenient tools. Powerful yet easy to use for beginners and pros alike. For several page templates additional configuration options will appear, after you publish the page, where you can easily fine tune your content to the last detail. Book Your Travel theme comes bundled with the very popular Slider Revolution plugin for you to create a responsive (mobile friendly) or fullwidth slider with must-see-effects with all content always readable by search engines. You can customize this slider with a convenient drag&drop backend to suit your needs. This plugin features tons of unique transition effects, an image preloader, video embedding, auto play that stops on user interaction and lots of other easy to set options to create your own effects. The homepage is fully widgetized. This means that there is one template with unlimited layout possibilities. Sidebars, widgets, lists, you name it and all with a simple drag and drop populated from the WordPress Widgets area. you want to sort them by (Title, ID, Random, Publish Date, Comment Count), define whether you want to show only featured accommodations, filter by accommodation type(s), such as apartments, villas, hotels etc. and accommodation tag(s) such as beachfront, family, wellness, etc if you want to fine-tune the content. You can also set the display mode: card view is used for content areas and small mode for sidebar areas. You can choose how many car rentals you want to display in this widget, how many car rentals you want to display per row, what do you want to sort them by (Title, ID, Random, Publish Date, Comment Count), define whether you want to show only featured car rentals, filter by rental type(s), such as economy, mini, sedan, etc. and car rental tag(s) such as city, electric, luxury, etc if you want to fine-tune the content. You can also set the display mode: card view is used for content areas and small mode for sidebar areas. You can choose how many cruises do you want to display in this widget, how many cruises do you want to display per row, what do you want to sort them by (Title, ID, Random, Publish Date, Comment Count), define whether you want to show only featured cruises, select cruise type(s), such as family, senior, luxury etc. and cruise tag(s) such as adventure, family, last-minute etc. if you want to fine-tune the content. You can also set the display mode: card view is used for content areas and small mode for sidebar areas. You can choose how many tours you want to display in this widget, how many tours do you want to display per row, what you want to sort them by (Title, ID, Random, Publish Date, Comment Count), define whether you want to show only featured tours, select tour type(s), such as city, daily, weekly etc. and tour tag(s) such as adrenaline, history, nature etc. if you want to fine-tune the content. You can also set the display mode: card view is used for content areas and small mode for sidebar areas. You can choose how many locations do you want to display in this widget, how many locations do you want to display per row, what do you want to sort them by (Title, ID, Random, Publish Date, Comment Count) and define whether you want to show only featured locations. You can also set the display mode; card view is used for content areas and small mode for sidebar areas. You can choose how many locations you want to display in this widget, how many locations do you want to display per row, what do you want to sort them by (Title, ID, Random, Publish Date, Comment Count) and define whether you want to show only featured locations. You can also set the display mode: card view is used for content areas and small mode for sidebar areas. An advanced search form that can be used on the home page or elsewhere for filtering the search results page. Advanced search parameters are editable. You can select what general search filters do you want to show (What, Where, When, Price range, Rating, Stars), make catered / self-catered accommodations / car rentals / cruises / tours searchable, define whether to make accommodation / car rental / cruise / tour types visible, change all default text and more. Here you can insert a title, your company name, address, phone number and email address. Linking to your social media profiles has never been easier. Insert your Facebook & Twitter IDs, add URLs to your Youtube, LinkedIn, GooglePlus, Vimeo, Pinterest,Skype, Whatsapp and Instagram profiles and RSS feed and you will be fully connected. A set of boxes that stand out for displaying additional content on the home page or elsewhere. They are perfect for listing services, information about the website/company, contact etc. On every page you can choose whether you want to display left sidebar, right sidebar, both sidebars and none. You can assign any number of widgets to each sidebar. Book Your Travel theme supports MailChimp and MailPoet plugins for you to connect your website with your email marketing campaigns. You can use a flexible mega menu plugin to beautifully display your menus. You can edit fonts, colors, backgrounds etc. and easily add your custom content and widgets. TheGem is a versatile, responsive, high-performance WordPress theme with a modern creative design to suit a multitude of creative uses for building websites. It was designed and developed as an ultimate web building toolbox of design elements, styles & features. This theme will help you build impressive, high-performance website in minutes, without touching a line of code. Don’t waste time on coding, explore your creativity! TheGem has been carefully crafted for a variety of creative uses with such flexibility it really one of the best multi-concept WordPress themes. With over 40 unique multi-purpose design concepts, 150 stunning demo pages, eight navigation settings in over 20 styles, plus flexible page layouts, the possibilities are really unlimited. It is perfect for corporate business of any size and purpose, creative agency with fancy ideas, including fully featured WooCommerce fashion store ready to go, your website will spring to life within minutes. This theme also covers the needs of freelancer, photographer, architect & digital artist, offering amazing portfolio features with dedicated designs to suit individual needs. As experienced blogger seeking for unusual blog layouts that help to stand out, you will be inspired by TheGem’s blog features. If you are a designer looking for a website with flair, then look no further. TheGem has been built with creative passion at heart, collaborating with top designers from Behance.net you will find eyepopping slick designs we know you will love. TheGem for WordPress delivers everything to cover your ambitions & creative needs. TheGem focuses only on addons & features which are needed for creating a diverse, unique website. Reducing the plugins dependency & optimising the code, it achieved a much more stable and secure theme than many other multi-purpose themes on the market today. What makes TheGem stand out amongst the crowd? Eventum is an incredibly easy to use and customizable events manager WordPress theme. Whatever your plans are concerning creating your organization’s event management portal, or you are planning to launch a multi-city portal where event organizers can advertise their events, then Eventum is the perfect theme for you. The Eventum event management theme comes loaded with a wide range of functions for both admin and event organizers. This powerful, modern and stylish theme can also be used for event ticketing and registration of attendees when used with the free WooCommerce plugin or our Event Ticket Booking plugin. You can use Eventum to create your company’s event management portal or can build your very own events portal for niches like sports events, music, dance, business events, conferences, festivals, workshops, classes, courses or public speakers. You can launch a professional and powerful events portal for absolutely anything, subject or industry you like. This stylish Events WordPress theme for event management is responsive. It also comes with a built in mobile app view option. Once activated, website will look like an app on mobile devices. The mobile app view can easily be switched ‘On’ or ‘Off’, the choice is yours. This events planner theme is Search Engine Optimized and its code was built with SEO in mind. Eventum supports the popular free SEO plugins such as Yoast SEO, All In One SEO, Google XML Sitemaps and All In One Schema.org Rich Snippets. Here is some of the key functionality that makes Eventum one of the best WordPress themes. The theme is loaded with functions for admin, users and event organizers, Eventum is also a stylish, powerful and responsive event calendar WordPress theme. Users can browse events on the calendar with a simple mouse-hover over any of the calendar’s dates. Displays event name, location, start and end dates and times. A link pointing to the page with a list of all the events occurring on the date which is hovered over. Event organizers can add two types of events – “Regular” and “Recurring” on your site. Here are the things that event organizers can do with it. Allows your users to add regular as well as recurring events. Recurring events can be repeated daily, weekly, monthly and yearly with additional options for each (e.g., choosing specific days of the week) till the specified period. Shows a list of all future occurrences on the recurring event detail page. You may also charge extra (and of course, recurring fees) for recurring events. Shows the list of event attendees and also helps in making events the talk of the town and encouraging people to attend. Every event detail page displays a list of total attendees. An option using which users can confirm their attendance. Like attendees list, logged-in visitors can also have the list of all the events that they will be attending. The tabs are specially designed for the front-end event listing pages to make it simple for your users to navigate around and to encourage quicker and easier event registrations. All event listing pages feature three tabs for easier navigation, “Current, Upcoming and Past“. As an admin you can define the default tab as well as default view (grid view and list view) for events. Connecting an event with any existing listing on your site is possible. Your site’s registered users can also connect their event with a listing/place they’ve submitted. Event organizers can link their events with any listing/place on your site from their user dashboard. A dedicated sidebar widget is provided which helps users connect their events to their own listing. When connected, events appear on the listing detail pages inside a separate tab and don’t interfere with the original content. Provides you an option of adding an event to your calendar on the event detail page. Uses 4 built-in calendar options to add in any event. Four calendar options are “iCal Calendar”, “Google calendar”, “Yahoo Calendar” and “Outlook”. The Eventum WordPress theme is compatibility with the WooCommerce plugin which will give you an event booking WordPress theme. Create a product and link it to your events. Also show the exact number of available tickets. A “book now” button is displayed on the event detail page from where people can purchase tickets for the event. The theme is also expandable to allow event organizers to sell tickets on your site. You can install the Event Ticket Booking plugin which has been designed for Eventum. This add-on will also work with the directory theme and its child themes. The Events plugin which is included with Eventum is also required. The theme offers a powerful reservation and booking system on your directory. It can be integrated with the industry’s best booking services. By Installing WooCommerce Booking plugin it turns your portal to a fully-fledged booking system. Allowing users to book hotel accommodation, rental properties, hire cars, book tours, appointments or even restaurant tables and a lot more. The Eventum theme comes with minimal Newsletter functionality. It enables you send your events as an email to your contacts. Below is a summary of themes that makes up our top 10. Mikado One – Multi-Concept WordPress Theme by Mikado-Themes on ThemeForest. Mikado One Features 37 Demos 45+ Custom Shortcodes 600+ Google Fonts Extensive Admin Interface Retina Ready Custom. The Mikado one theme also comes with exclusive elements plugin that further enhances and extends Visual Composer capabilities. It adds dedicated post types, page templates and VC shortcodes/elements for Portfolio, Photo and Video Albums, Testimonials, Team and many others. What set Pluto WordPress theme apart from the millions of themes out there is the extra features you get. Features like smart photo protection that prevents your images from being copied, Ad management and unique QR code reader makes it a top 10 best wordpress theme. It also met all our ranking criteria with great reviews on the themeforest market. Total is one of the few themes that were coded with developers in mind. It’s got lot of useful hooks, filters and snippets to make life easier. Total includes the Visual Composer, but that’s not all. Total also includes custom page builder elements to give you more than 100+ easy to use, drag & drop elements to create custom page layouts. With options for sliders, WooCommerce, milestones, icon boxes, pricing tables, headings and more, Total has a vast array of custom built elements. Total is fully compatible with the bbPress forum plugin (created by Automattic – the team behind WordPress). They’ve even gone a step further than other themes and have completely styled bbPress to match the theme so when your visitors switch between your homepage and your forum they’ll know that they’re still on the same site. Total is also translation ready. It supports RTL( translation files included) and fully compatible with WPML. Salient is a creative Multi-Purpose WordPress Theme with over 72,000 Sales. Salient was first developed back in 2013; it’s been constantly updated and improved since its initial release. With so many WordPress themes vying for your attention, Salient seem like the right choice no matter what type of website you’re building, Salient aims to provide you with everything you need to get online in style. From corporate homepages and creative agency websites, through to multimedia portfolios and online shops, Salient has a prebuilt demo to match. If your needs are more bespoke, then the wealth of customization options give you the freedom to mix and match the best elements of Salient to get the right look and feel for your project. It includes page building functionality with a customized version of the Visual Composer, theme’s options panel and a copy of the Nectar slider. If you wish to build an ecommerce site with it, it integrates seamlessly with WooCommerce and adds some extra features such as an Ajax shopping cart. Salient is best suited to someone whom is either starting a new website or preparing to give their existing site a complete design overhaul. Furthermore, Salient is a good option for those who are happy to choose from a selection of prebuilt demo modes, and then apply them to their site wholesale or just make a few customizations through the theme options or page editor tool. X is a percentage grid based theme that is completely fluid. It doesn’t matter what size your device or browser window has, the site will always look spectacular. Thanks to the percentage grid, there is no predefined fixed width and text floats around elements and images with ease. Achieve virtually any look and layout from within the one and only X WordPress Theme. Stacks allow you to choose from multiple, completely unique designs with just the click of a mouse, and there are currently four Stacks to choose from (with more in development). X theme also includes the iLightBox plugin which is a responsive lightbox solution that is simply amazing to behold. Purchased separately, iLightBox costs $13, however it is included for free with the purchase of X. With touch navigation, a smart content recognizer, and a host of other high-end features, be ready for your lightbox images to look good on every device (and fully respond too). The tagline for Jupiter is build and create. Thanks to the features it offers, you should have no issues doing either. Jupiter is positively brimming with 60+ pre-built website templates. These ready-made designs cover a wide range of categories. These demos are suitable for restaurant, medical, sports, conference, portfolio, charity, and agency websites, plus much, much more. No matter which pre-made website template you choose, you can use any of the blog post layouts on your site. Thanks to the handy Jupiter Posts Option control panel that is displayed after the post editor, you can easily choose the best post template or layout for each piece of content, on an individual basis. The theme is also light; therefore you should expect lightning fast loading time having earned 94% in Google PageSpeed & GTmetrix scores. This premium WordPress theme packs a detailed theme options control panel, useful premium plugins and well-supported by its creators. It’s suitable for almost any project. The only drawback is it theme option complexity for a new WordPress user or basic blog site. Endless choices for how you want your website to make its first impression. BeTheme is one of the most popular multipurpose WordPress themes for a long time. It is by far the biggest of the premium themes in terms of functionality as well as in terms of ready to use pre-made layouts. The tatest version is incredibly light weight and cleaner compare to older versions. It has loads of other features that makes it rank in our top 10 including a shortcode generator which allows you to build pages easily and quickly. Other features that makes it standout is the built-in mega menus, one click skin generator Maintenance mode and blank page, and unlimited Google map styles. Impreza is among the most popular and highly rated themes on Themeforest with over 37,963 sales. Features that give impreza the edge includes child theme support, custom html & css editors, code built with seo (search engine optimization) best practice in mind, animated appearance of columns and images at any page, WooCommerce compatible with full design integration, bbpress compatible with full design integration, tablepress compatible with full design integration, full compatibility with contact form 7 and gravity forms. Imreza is also translation ready with 8 languages included: German, French, Italian, Spanish, Russian, Brazilian Portuguese, Turkish and Dutch. It supports RTL (translation files included) and fully compatible with WPML. Its easy-to-use elements (shortcodes): Accordion and Toggles, ActionBox, Button, Chart, Client Logos, Contacts, Contact Form, Counter, Custom Heading, Google Maps, IconBox, Image Gallery, Image Slider, Message Box, Person, Pricing Table, Progress Bar Portfolio Grid, Responsive Columns, Separator, Sharing Buttons, Social Links, Tabs & Timeline, Testimonial, Tour and Video makes it standout. Impreza has a feature that lets you try the theme out before you buy it. You can actually migrate your existing site content over to the test site, test compatibility with other plugins, and try out all the features to see what your site would look like using Impreza. For more advanced users, Impreza also includes a child theme for you in case you want to implement your own customizations without losing them when the theme updates. This is a big time saver for those who like to customize their themes. The7 features full and seamless integration with Visual Composer and Ultimate Addons. The Theme’s 750+ Options enable you to craft almost any imaginable design. And Design Wizard feature lets you create a boutique-grade website design in mere minutes. The7 comes bundled with Visual Composer page builder, Ultimate Addons, Slider Revolution, Layer Slider, Go Pricing Tables and ConvertPlug. It is also fully compatible with most popular plugins like WooCommerce, WPML, Yoast SEO, All in One WP Migration, W3 Total Cache and many others. The7 is mobile friendly and SEO-ready. There are 26 (and counting) high quality dummy websites that you can import in only couple of clicks and use as a foundation for your website. The7 Theme also comes with exclusive elements plugin that further enhances and extends Visual Composer capabilities. It adds dedicated post types, page templates and VC shortcodes/elements for Portfolio, Photo and Video Albums, Testimonials, Team and many others. The7 has an advanced and unique page templates system. It allows you to choose a header layout, sidebar, footer, and over 230 other settings for each page/post/project/etc. individually. What makes The7 our number 2 theme in the ranking is the special feature that allows you seamlessly create landing pages and micro-sites within your main website with no additional set up. Avada is the best-selling WordPress theme of all time on Themeforest. Avada is a multipurpose theme used to create just about any type of site, be it an online portfolio, a showcase for your business, an eCommerce shop, a social media style project, a gallery site or anything else you might need. No matter what you need, it can offer you everything you need to design a top-notch site through various functions and features that we’ve come to expect in today’s complex website requirements. While the Avada packs a huge features list, one reason why this gorgeous theme is our number 1 is its Fusion Builder, which comes with plenty of pre-built templates. This brand new Fusion Builder is user-friendly, intuitive, and packed with significant features saving your precious time and efforts. It comes loaded with a multitude of options allowing you to add almost any element to your site whether or not you are aware of any coding know-how. It is clean and has a fully responsive design. By offering a sophisticated tool, Avada ensures your site gets noticed. It is very intuitive to use and perform out-of-the-box. Offers various demo pages and pre-loaded setups with the ease of a one-click installation. The only down-side I can think of is that Avada is literally not suitable for simple websites or blogs. In these cases, the multi-purpose nature of Avada can go to waste and the various configuration options will create more friction than they will provide value. Avada is a premium download that needs stable servers as memory usage can create complex issues for some hosting providers. It is advisable to choose a good hosting company to make the best use of it. The Avada WordPress theme and ThemeFusion set a high standard with numerous possibilities and a multitude of new features, flexibility, free updates and ease-of-use. That’s of course, besides including top-notch support with your purchase. Live websites using Avada WordPress theme. Are you a business professional with a portfolio such as a graphic designer, web developer, author, specialist or just want to present your CV or profile in a fashionable way? Look no further as the themes below includes the best wordpress portfolio themes to help present your business perfectly. Business Club is a multipurpose, clean and elegant WordPress theme with a premium look, feel and features that cannot only be used for just business websites but also for other WordPress sites. Some of these other websites the theme can be used for include educational institutes, personal portfolio, blogging platforms, etc. Business Club is a simplistic but very elegant and scintillating theme which has all the features that you will need handcrafted into it. Even with all the dazzling features the theme is optimized with standard coding, frequent maintenance and expert quality assurance so that you will never have to compromise quality and speed. By popular analysis, this is a theme built with SASS and Foundation. It is a simple, modern Portfolio theme supporting the popular wordpress plugin, Jetpack. The many sections built into the theme include; about page, services, portfolio, image gallery, and blog posts. It is built on a concept of simple and neat design. Jinn is built especially for web developers, architects, graphics designers, photographers, freelancers and so on. If you are a newbie and you want a portfolio website, Jinn is an awesome choice. Latte is a one-page parallax WordPress theme for developers, designers & freelancers, to showcase their profile. It is an awesome multipurpose theme with a very friendly one-page design. Latte has a very responsive layout, it provides a smooth parallax scrolling, a full-width header, a one-page design, a social menu with big icons, full-width ribbons, a slide-out menu, an easy customizer, a nice portfolio, pricing tables, colourful skills page, Google Maps, a simple contact form, a blog layout, lazy loading effect, unlimited colours, and it is translation ready all with a lovely modern look. Need ask for any more features? It can be used for various businesses – corporate or creative ones. It comes with many options, including services section, and more, plus, it’s very easy to customize. You don’t even need a page builder or a drag & drop editor. Every single thing can be customized straight from the WordPress Customizer. The main colours of this theme are white and grey, which provides a touch of elegance. Latte can be also used by developers, designers, and freelancers to showcase their profile and works. Astra is the fastest, fully customizable & beautiful theme made perfect for blogs, personal portfolios and business websites. It is very lightweight (about 50kb) and offers undisputed speed. Built with SEO in mind, it comes with schema.org code integrated making it easy for search engines to love your site. Astra offers plenty of sidebar options and widget areas giving you full control for customizations. Some of the other features include; WooCommerce Ready, super responsive, compatibility with major plugins, translation ready, extendible with premium addons regularly updated, designed, developed and maintained. Astra is supported by Brainstorm Force. Are you looking for a perfect base theme? With Astra, you needn’t look any further, it is a beautiful, fast and fully customizable theme. Piclectic is the theme you would use to create a simple image gallery that is meant for sharing with style. Piclectic is very responsive, retina ready, and flawless for high resolution photo collections. It is also quite easy to use, it’s as simple as adding posts with Image post formats. The Theme’s elegance and simplicity assists individuals to represent their personal sites at ease. Every individual looking to showcase and brand one’s personal information must-have this great theme. Aided with control tools for Theme options of various Layout and Footer options, the Biography theme’s unique features includes but is not limited to: header banner, Font-family setting, and text slider with background image offers relentless control to mould the theme however you need it to be. With top notch code quality and extended Customizer settings for various sections like the: Service, Review, Testimonial, and so on. This theme is perfect for business purposes and has been made WooCommerce ready. Medical Circle is one of the best and very useful WordPress Theme for your medical websites. It is well suited for hospital, nursing home, general clinics, medical store, dental, pediatric, gynaecology, veterinary clinics, pediatric and overall medial websites as well as personal portfolio sites for dentists, doctors, surgeons, gynecologist, general therapist and all medical sector people. This theme is also suitable for corporate and business websites. Medical Circle is one of the most accessible themes that can easily accommodate all type of users ranging from users with zero coding skills to advanced developers. This theme has a lot of options for header section, menu section, slider section, homepage layout, sidebar options, blog page options, image size options, translation ready. Medical Circle includes excellent resources for medical professionals and practices of all kinds, with one click demo import, page builder friendly design, inbuilt theme options, and customizer based theme options, added custom widgets and many more features. It is designed in a way that you can use this theme for a variety of websites like businesses, corporate, conference, charity, non-profit, environmental, gym, parallax, political, one page, multipage, spa and shop etc. This theme is a pretty awesome theme thanks to its SEO friendly design and flexible features. From the name – a dead give-away, Beauty and Spa is a free beauty CSS3 Powered and WordPress latest version ready Theme for Beauty Salon and Massage Parlours. If you own either and looking for a theme that’ll give you everything you need to propel your brand, then look no further than this theme. It can also be used in any Small Business to Corporate Business. Beauty and Spa Theme is E-Commerce ready as it is fully compatible with the WooCommerce plugin. Mesmerize is an incredibly flexible, multipurpose free WordPress theme that can help you create an amazing website easier than you can probably imagine, by drag and drop. It comes loaded with; a custom pre-designed home page, 5 header designs and over 30 ready-to-use content sections that you can easily customize. Mesmerize is responsive so it works on mobile devices out of the box. It also has lots of customization options (video background, slideshow background, header content types, gradient overlays, etc.) that can help you create a beautiful, unique website in close to no time. Also, it is WooCommerce ready which means you can power your shop alongside and start selling right away! iThemer is a Portfolio and Resume theme with a simple list blog layout. iThemer consists of Animated banner, Services, Work, Portfolio with fancybox, Counter Up, Experience and Education timeline, Carousel Grid Blog, Call to Action, About us, Contact Us Section with Contact form 7, Client and Footer Widgets. The blog and single page come with a right sidebar. iThemer WordPress theme is specially designed for multipurpose portfolio sites but it can also be managed as a one page website. Zerif lite is a pretty friendly one-page WordPress multipurpose theme, with the great option of a full-width image in the background and a simple white menu bar at the top. It comes with an elegant and modern design, which could fit any kind of business very well. Zerif Lite has an interactive and colourful interface, with a classy parallax effect and lively animations. You can use it for your online shop as well. Zerif Lite also provides a responsive design, a clean and validated code, a blog layout, custom ribbons, lazy loading effect, smooth parallax scrolling, WooCommerce integration, theme options panel, translation enabled, an easy contact form, custom content blocks, and many other customization options. Idyllic is a free business WordPress theme that contains all the features you need to create a stunning website. The theme consists of well-organized parts so it’s easy to edit and customize everything to create a specific website that matches your needs. Idyllic is an ultra-responsive, Multipurpose, Corporated, Fully Optimized For Agency, Business, Corporate, CV, Personal, Portfolio, Fashion, Fitness, Financial, Ecommerce, Event, Services, SEO, Video and Blog or any other type of business theme. It is designed for Business but this is competent for every kind of site. It features multiple sections on the front page as well as widgets, multiple navigation and social menus, a logo, Colour options and more. Idyllic supports popular plugins like Breadcrumb NavXT, WP-PageNavi, Contact Form 7, Jetpack by WordPress.com, Polylang, bbPress, wooCommerce and many more. It is translation ready and you can easily customize it with the variety of options available using customizer. It consists of contact us template, gallery template, Corporate Template, widgets and Sidebar. It is designed and developed by Theme Freesia. Avata free WordPress theme is based on Bootstrap and coded with HTML5 and CSS3 language. It is fully responsive in desktops and mobile devices. With enriched settings, you can create a homepage easily with pre-built layouts such as banner, service, video, gallery, team, testimonial, blog, slogan and so on. You can also sort them by dragging and dropping. Avata theme is WooCommerce compatible we can use it for e-commerce site, multilingual ready (WPML & Polylang) and translateable. Corporate Hub is a Free Multipurpose WordPress Business theme suitable for all creative people, agency, creative business, company, individual or agencies portfolios, product or service selling website etc. Corporate hub is a very modern and creative template, suited for different types of businesses or organisations. It is very flexible, with a clean and professional design. It is the perfect theme to build a great website for your company. iCoach is clean and fully customizable, search engine friendly, mobile responsive, premium quality free WordPress theme for individuals like Coaches, Freelancers, Yoga Teachers, Doctors, Consultants, designers etc. For the benefits of this theme, the fact that it’s free is remarkable. You can easily customize colours, add your own logo to make it match your business branding. It works with SiteOrigin drag and drop page builder so you can easily create a unique layout for your website and you can also create unlimited variations of the home page as you will need. It has an incorporated mobile friendly slider to showcase your top services or skills on the home page. Ignis is a free modern portfolio WordPress theme that features a custom home page template to display your projects, font and colour options, multiple blog layouts and a lot more. To use the portfolio feature in Ignis however, you need to have Jetpack installed. Company Elite is a quite delightful, inventive and enhanced business WordPress theme with innovative design. It is simple to utilize and can be used effectively which helps you showcase your specialty. Company Elite is WooCommerce enabled and a user without much of a stretch can introduce a shop section to their website undisturbed and can change it to anything they like, seeing as it is a multipurpose theme. If you are hoping to direct some genuine business and need to put it on the web, Company Elite is topic made particularly to suit your requirements. Corporate Key is a creative, elegant, and optimised business WordPress theme with breath-taking design. It is very easy to use and can be used efficiently without special skills which helps you compete in your niche market. Corporate Key is woocommerce enabled and users can easily install an unrestricted version and change it to anything they like since it is a multipurpose theme. Excellent is a super Responsive, Multipurpose, Corporated, SEO optimized multifunction, Business, CV, Ecommerce, Video and Blog WordPress Theme. It is designed for Business but it is very competent for every kind of site. The theme is designed and developed by Theme Freesia. With a focus on business sites, it features multiple sections on the front page as well as widgets, multiple navigation and social menus, a logo, Colour Options and more. Excellent supports popular plugins like Breadcrumb, NavXT, WP-PageNavi, Contact Form 7, Jetpack by WordPress.com, Polylang, bbPress, wooCommerce and many more. It is 100% translation enabled and you can easily customize it with lots of options using the in-built Customizer. It consists of a contact us template, gallery template, Corporate Template, widgets and Sidebar. Quite Excellent wouldn’t you say? Brand is a lightweight, fast, flexible WordPress theme that is also mobile and tablet responsive. It is cross browser compatible, very easily customizable: change colours with ease, typography, enable and disable elements, add left or right sidebar and much more. It is a fabulous start-up centralized theme. SimplUI is designed keeping the mass users in mind which is white clean and responsive, from interacting with the website to designing UI/UX everything is simple and explicit. It is tested with non-tech users and the results are positive. Codes are optimized and extra file is added to increase performance. NOTE: Images only for demo purpose. Not included in the download package. All credits are mentioned on the Documentation.